I am in the last few weeks of creating my most precious masterpiece! I am looking forward to the new adventures that awaits me as a new mother, I am also interested to see how I juggle commissions as an artist and being a mother. With that being said, I will still take orders but very few to insure a timely turnaround. Please contact me with any and all questions if you would like for me to create something for you! I am looking forward to channeling this new source of inspiration aka my baby! New addition to the Prisma Series. Creating a series that is transparently me is self fufilling, but presenting it to a gallery is beyond horrifying. Taking that next step shortly... wish me luck guys! The need to create and the want to create has nothing to do with one another. Due to planning and hard work, I have been so privileged to quit my job in banking and pursue my passion & art career. With support from my husband and clarity I am now CREATING with confidence. From this new creative process I have developed a raw and original style that completely embodies me. I am also creating a portfolio in hopes to share my creations with others in a gallery. THATS MY END GAME. I’m not sure if you would call what I do a passion, it’s more of how I function to the best of my ability. I am happiest when I paint or draw. I need to create in order to have a clear head. I have recently discovered I am complete when I simply create from my heart and soul. I hope you enjoy my new direction! In progress painting of a herd of cows, I have a feeling it’s going to be lovely! Completed painting coming ASAP! I absolutely love painting fun, loose, and colorful subjects for inspiration and to get the creative juices flowing. A color pencil commission of a beautiful cabin in the Smokie Mountains. Some small acrylic paintings that were so fun to create! A small sample of what I have created for the BOCA Art Show in Greenville, SC this November 12, 13, & 14th! I have recently completed a piece of work I refer to as an "art temper tantrum" . It was a piece I created just for me. The result has inspired me! Look out for my new series of "talking heads"... still working on a series name, so bare with me. I'm looking forward to seeing the end result! Did I hear pop up? My very first time participating in a Popup Art show! It has been so fun working with boco art. Greeneville, SC photo from drop-off day. Popup November 16th & 17th. Cow Pasture series coming soooooon. 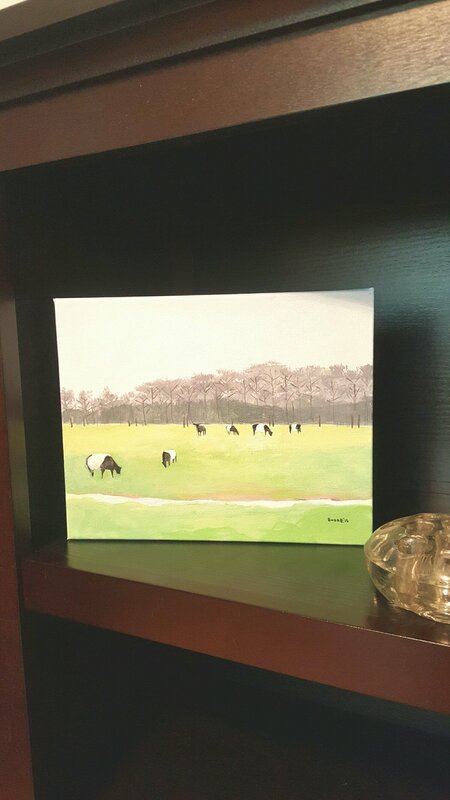 A small 8x10 painting of cattle can add southern charm in any room, no matter how large or small it may be! 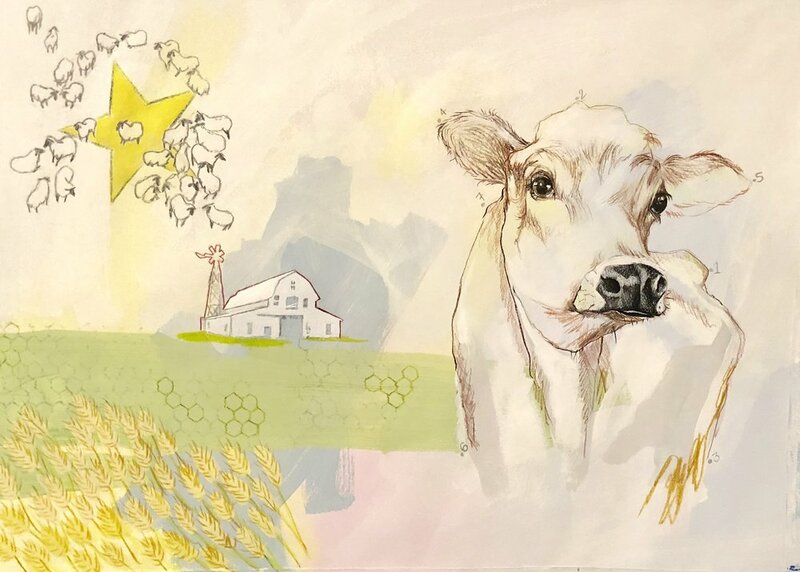 Starting the cow pasture series this weekend. Follow me on instagram @boonesasser for postings!! 8x10 inch acrylic on canvas. This small 11x14 painting by me comes alive just by being in a great frame!! 18"×24" Drawing lovely people is a plus. My recently accomplished goal was loosening up my drawing technique. I now apply contrast no matter how dark or light with a new found confidence, I no longer linger in areas or have to go back as often. This feels amazing! I have found a couple new passions..
Natural light is EVERYONE'S friend. My handsome husband and Penny.